This month I traveled to Northern Sweden and joined my friend Fredrik Prost's community for the annual marking of their reindeer calves. It was an amazing experience I will never forget. 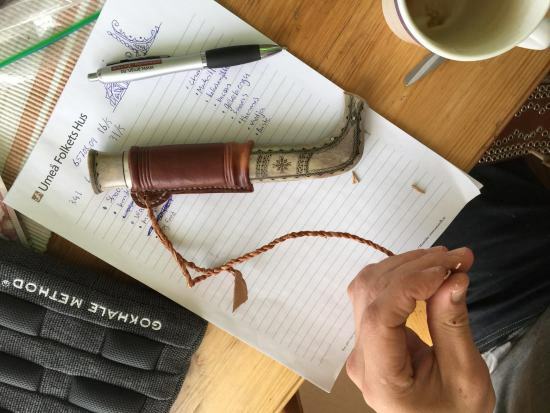 Though the Sami have given up many of their traditional ways, many persist and in the coming months, I will share aspects I found inspiring or educational. Fredrik finishing working on his new knife. More of his work here. Notice the inclusion of our Stretchsit cushion alongside some other basics from the modern world! 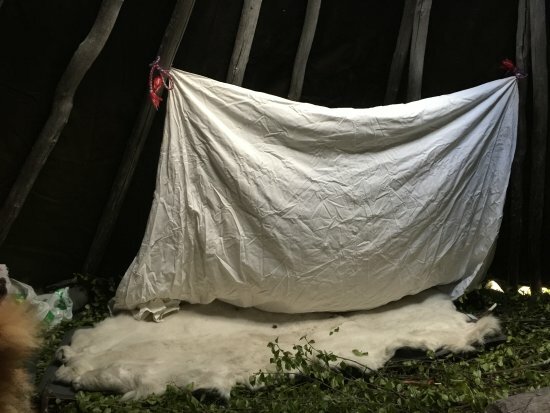 Traditional Sami housing is a tepee or lavoo, with long birch poles forming the main structure (these used to be transported from place to place by domesticated reindeer), and stitched reindeer skin providing the cover. The top of the lavoo is open to let smoke from a fire escape. 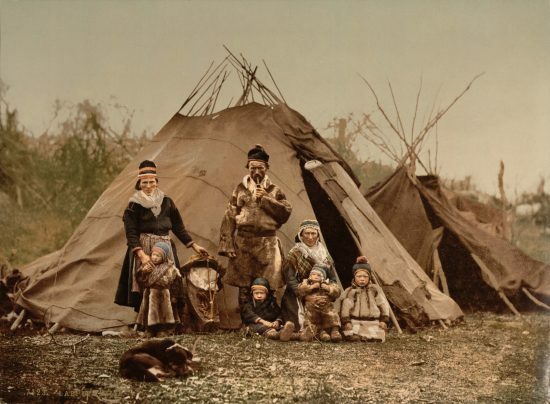 Today most Sami live in regular houses or cabins with varying degrees of modern facilities. Fredrik owns a summer cabin in a village inhabited by his paternal relatives; we visited a village inhabited by his maternal relatives where he does not own a cabin. We stayed in a traditional lavoo though we still had many modern conveniences with us. Soon after arriving at the village (after a five-hour trek that was a good reminder for me to up my game in fitness and strength! ), we cut young birch branches to create a floor. I used my newly acquired knife that I had commissioned Fredrik to make for me. Fredrik (and I, not visible) cutting small birch branches to create a traditional mattress. 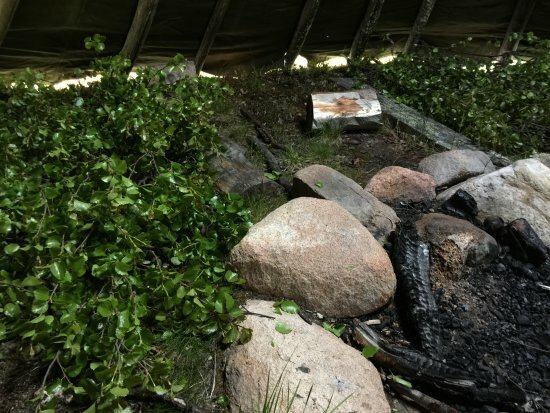 The birch branches help elevate you off the cold ground (this is the Arctic, where the ground remains cold all year round) and away from the gap at the lower border of the tepee. They are also supposed to soften the surface you are sleeping on but I can’t say I noticed that effect very much! We had carried in thin foam pads that went on top of the birch branches which were then topped off with reindeer hides from one of Fredrik’s cousins. His cousin Monica also lent me a rakas (this means “love” referring to the privacy it affords you in a communal tepee). The rakas, suspended from the tepee poles, provides protection from mosquitoes and 24-hour daylight. It also offers privacy in a communal tepee. This is so much better than the miserable mosquito net I had brought along from REI - it blocks out mosquitoes very effectively (thank goodness!) and light (foreigners who stay in the Arctic longterm report having much more trouble with 24 hours of daylight than 24 hours of dark in the winter). 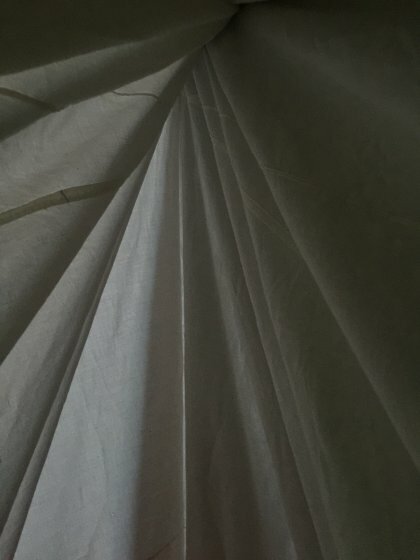 My cocoon's space under my rakas served as refuge and a place where I could read Alexander Hamilton (highly recommended and a wonderful balance for my otherworldly experience). The view from inside my cocoon under the rakas. at the bottom of the cover though they'll find any hole higher up. I’ve known theoretically that it’s important to periodically check out from one’s usual scene, but it’s only when I actually do it that I fully realize just how important it is. For the first week of July, I had nothing much firing between my ears - no thoughts of things to do, no urgent insights, no place I needed to go or people I needed to see. I just experienced life similarly to how the Sami do. 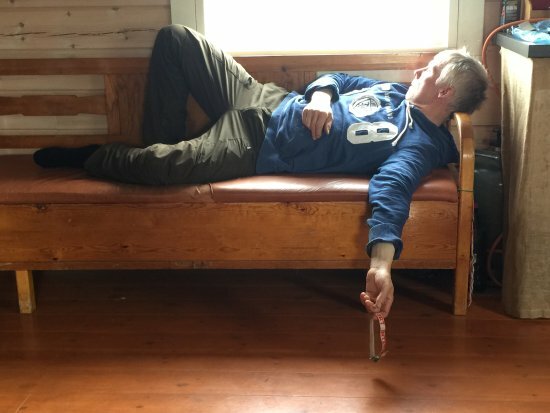 About the sleeping position: what is the left arm underneath (the one we can't see) doing? where is it positioned? It's providing additional thickness, as needed, so the head is neither angled up or down uncomfortably. 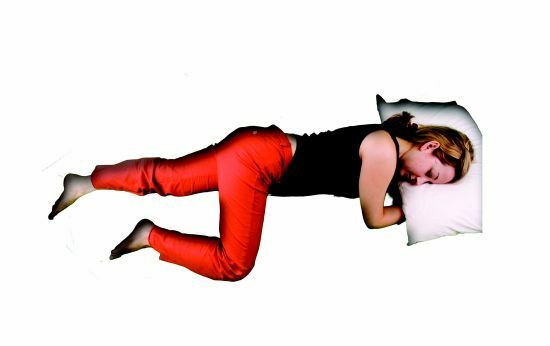 The arm could pointing straight up above the head (this is what I usually do), or be folded at the elbow so the forearm or hand are under the pillow acting like a second pillow. I'm glad this is interesting to you - it certainly was to me! I'll share other posture/wellness lessons learned in subsequent posts. Thanks for commenting! Another question about the sleeping position (going to be on the floor for a few days soon): how does a fuller chested woman make it work? You turn your body thourgh an angle that your body, including your breasts, finds comfortable.